A day after 24 persons were left killed in a massive clash between police and members of a sect who had encroached on a government land in Mathura, opposition parties, especially the BJP, targetted the ruling Samajwadi Party and Uttar Pradesh Chief Minister Akhilesh Yadav over "complete breakdown" of the administration and law and order in the state.Akhilesh Yadav ordered a commissioner-level inquiry into the violence while the Centre sought a report from the Uttar Pradesh government on Thursday's violence in Mathura, over 160 km from the national capital. Over 300 people were arrested in the violence that also left 23 policemen injured, including many seriously. "This is a serious matter and will be investigated at commissioner level. All those found guilty will be brought to justice," Akhilesh Yadav told reporters.Twenty-four people were killed in the clash between police and encroachers during an anti-encroachment drive on Thursday in Jawahar bagh in Mathura. 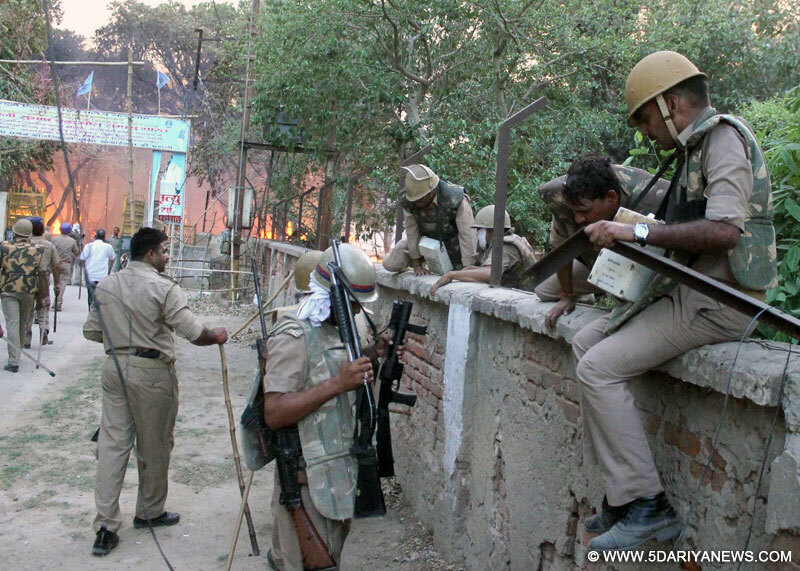 Those killed include Superintendent of Police Mukul Dwivedi. While around 300 people have been detained for their involvement in the clash, the city continues to be tense even as heavy police reinforcement has been deployed.The chief minister also accepted that there was a lapse in the handling of the matter. "Many attempts were made to hold discussions (with the encroachers), warnings were issued, but they still didn't evacuate the land. There has been a lapse as well. The mistake was the police went without full preparation. There was so much danger involved. No one knew how many explosives were inside," he said.Asked whether it was an intelligence failure, the chief minister replied: "It wasn't an intelligence failure... after inquiry only it would be clear how many weapons (revolvers and bombs) were there. "Akhilesh Yadav also announced ex-gratia relief of Rs 20 lakh each for the families of the two police officers killed in the violence.Union Home Minister Rajnath Singh reviewed the situation in Mathura and assured all help to the state government.Minister of State for Home Kiren Rijiju said there was lapse on the part of state government and it should ensure that such unfortunate incidents do not recur. He said the home ministry is waiting for the Uttar Pradesh government's report over the incident.State Governor Ram Naik also sought a detailed report about incident. He said proper inquiry should be conducted, the accused arrested soon, and strict legal action taken against them. Criticising the ruling Samajwadi Party, former Chief Minister and Bahujan Samaj Party (BSP) supremo Mayawati sought resignation of the Akhilesh Yadav government.She demanded a "time-bound judicial probe" into the incident, saying a commissioner level probe "will only be considered as a formality".Congress Vice President Rahul Gandhi condoled the death of police officers and others, and said the incident stands as a "reminder" of the deteriorating law and order situation in Uttar Pradesh.Demanding a Central Bureau of Investigation (CBI) probe into the matter, the Bharatiya Janata Party (BJP) came down heavily on the Uttar Pradesh government over the incident and maintained that without political protection the people could not have stored large quantities of arms and illumination.BJP spokesperson Sambit Patra stated, "There is a complete breakdown of administration and law and order situation in Uttar Pradesh. Mathura is not a small city. It is a centre of the region and such a hoard of ammunition and weaponry was getting piled up there. How did the local administration miss that? How can such error happen? "BJP Secretary Shrikant Sharma, who rushed to Mathura on the directions of party President Amit Shah, faulted the Akhilesh Yadav government for letting the situation get out of control. "It was the Samajwadi Party goons who encroached on the Jawaharbagh area some three years back and police was not given the freedom to act. It's a matter of sheer negligence," Sharma told IANS. "We demand a CBI inquiry into the matter," he told a press conference at Mathura.Actor-turned- politician Hema Malini, who was elected to the Lok Sabha from Mathura on the BJP ticket in 2014 polls, also favoured a CBI inquiry into the incident.On Thursday evening, encroachers attacked a police team which had gone to the Jawaharbagh area of Mathura to ensure peaceful eviction of encroachers as directed by the Allahabad High Court.The group, which calls itself "satyagrahis" or revolutionaries, was staying in the park on the pretext of staging demonstrations and occupying the 300-acre Jawaharbagh since January 2014.